LEGAZPI CITY – Albay Governor Joey Salceda has asked the Mines and Geo-sciences Bureau to investigate Sunday morning’s landslide in Manito town after residents blamed the Energy Development Corp. for the incident. The landslide also buried 90 hectares of rice fields and 75 hectares of vegetable farms. Responding to the incident, Manito Mayor Caesar Daet said the victims will be relocated to a safe area. But on Tuesday, furious landslide victims staged a protest action and barricaded the village road, preventing employees and vehicles of EDC from passing through the area. Salceda had to ask the Philippine National Police to help pacify the enraged residents and urged the MGB to probe their claims. “We’re asking Arlene Dayao of MGB-Bicol to conduct an investigation on the incident before coming up with necessary solutions since the MGB is the authority. Then we will discuss the findings and make solutions,” Salceda said. He also directed the Manito mayor to talk to the victims and the Provincial Social Welfare Office to ensure food supply. 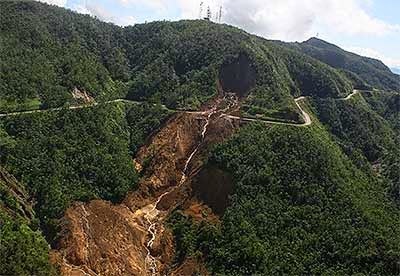 Cedric Daep, chief of the Albay Public Safety Emergency Management Office, said, "Manito is one of the landslide-prone towns in Albay with historic and rhetoric landslide occurrences since time immemorial."